This past Sunday, the New York Times Magazine ran a terrific in-depth feature titled Palm Oil Was Supposed to Help Save the Planet. Instead It Unleashed a Catastrophe. Staff at Friends of the Earth worked closely with the reporter, ProPublica’s Abrahm Lustgarten, to share background information and analysis, supply contacts in Indonesia and bring him along on public events we hosted at the U.S. Senate and the San Francisco climate summit. Here are four takeaways from the article. The tropical rain forests of Indonesia, and in particular the peatland regions of Borneo, have large amounts of carbon trapped within their trees and soil. Slashing and burning the existing forests to make way for oil-palm cultivation had a perverse effect: It released more carbon. A lot more carbon. NASA researchers say the accelerated destruction of Borneo’s forests contributed to the largest single-year global increase in carbon emissions in two millenniums, an explosion that transformed Indonesia into the world’s fourth-largest source of such emissions. Instead of creating a clever technocratic fix to reduce American’s carbon footprint, lawmakers had lit the fuse on a powerful carbon bomb that, as the forests were cleared and burned, produced more carbon than the entire continent of Europe. That’s why Friends of the Earth opposed the Renewable Fuel Standard back in 2008, and why we continue to reject large-scale biofuels, even as we fight to ramp down fossil fuel production. Those who seek an easy out from the climate disaster that industrial civilization has wrought put a lot of faith in techno-fixes, whether they be biofuels, Biomass with Carbon Capture and Storage (BECCS) or geo-engineering. But it turns out that, like a lot of techno-fixes, swapping fossil fuels for plant-based fuels is merely shuffling deck chairs on the Titanic. If we’re going to reverse the momentum that has devastated the world’s climate, the first and best thing to do, across the board, is for the world’s elites and middle classes to decrease consumption. Indeed, 14 of Indonesia’s 32 billionaires made their billions from palm oil. 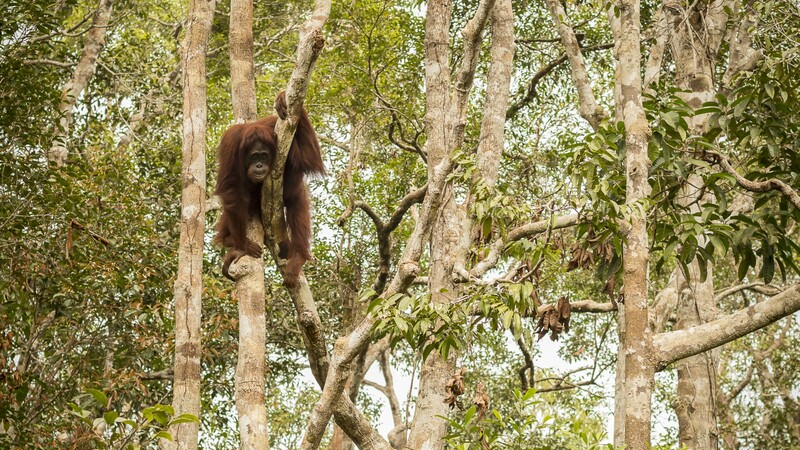 Threatened orangutan in ASMR palm oil plantation in Central Kalimantan. Image via Victor Barro of Friends of the Earth Spain. The palm companies keep getting stronger. In 2014, Indonesia’s highest judge and three associates were convicted in a huge bribery scandal that journalists have linked to palm land deals in Borneo. A few years later, a Kalimantan governor was caught granting palm concessions to family members, who flipped them back to the companies that paid for his election. Stories of corruption, and threats to keep it quiet, were legion. I was reminded of the threats that Suhadi had described — a series of anonymous phone calls and an intimidating run-in at a market in Jakarta. Suhadi went dark for several weeks as a result — hiding out in a friend’s house outside the city. His fear was justified. In 2015, one of Suhadi’s colleagues was stabbed to death outside a Jakarta nightclub in a case that news reports speculated was linked to his environmental work, and Global Witness has counted at least eight assassinations of Indonesian environmentalists fighting palm oil. In fact, just after I made a fact-finding mission to Central Kalimantan during the height of the 2015 peatland fires, our guide Gusti Gelambong (mentioned in the Times article) was arrested on false charges and imprisoned for six months. Sifting through the files, [Gusti Gelambong] retrieved copies of three contracts the company presented to its banks. Each contained a list of signatures — purportedly those of hundreds of villagers, consenting to let the microfinance corporation control their land and represent their views to the bank. Gelambong pointed to the long rows of names. Dozens of these people, he said, couldn’t read or write. When he asked some of them about their names in the document, they told him that they had never seen the paper before and that the signature on it wasn’t theirs. At least six of the signatures were from people who had died before the oil-palm companies arrived. Gelambong’s life hadn’t been the same since he went public with documents accusing Bumitama of seizing his village’s land. The company accused him of embezzlement, and he was arrested in 2016. He spent six months in the Pangkalan Bun jail before a judge determined that there was no evidence to hold him and dismissed the charges. 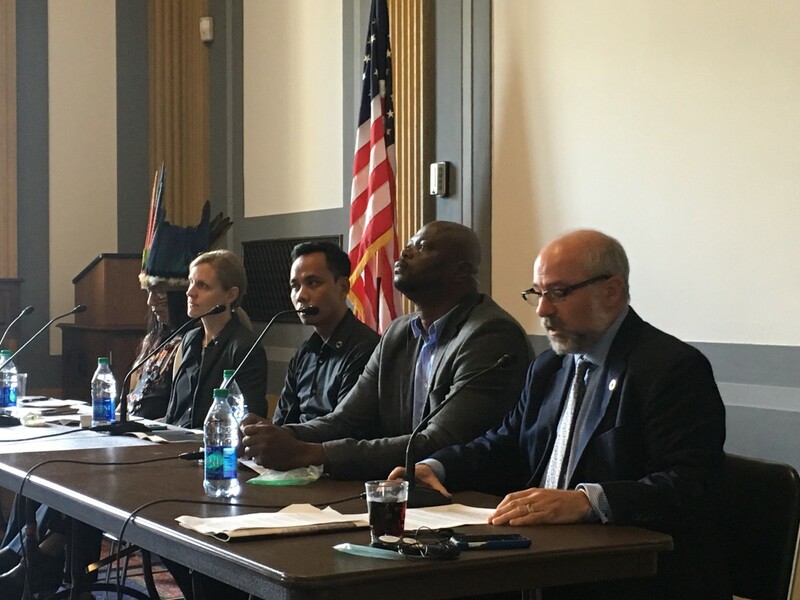 Senate briefing on private investment as a driver of tropical deforestation and climate change, hosted by Sen. Brian Schatz (D-Hawaii), Friends of the Earth and Amazon Watch, Aug. 2018. Yes, this is a discouraging sentiment. But what these comments reflect is an imperative to orient toward a development model predicated not on large-scale extraction for global markets, but on agroecology and agroforestry — both of which are predicated on securing the rights of indigenous peoples to manage their own lands and forests. “I asked how important the American biofuels mandate has been, given that other countries buy more Indonesian palm oil than Americans do. The answer was unequivocal: It’s what got Indonesian palm off the ground. “The U.S. is not only a market,” said Ruddy Gobel, the chief political adviser to the director. “It also sets the global agenda.” Now, according to the Indonesian development officials, 80 million Indonesians depend economically on palm oil, and nearly half the industry consists of individual landowners like the people in Kotawaringin. “If you pull out biofuel, the whole system will collapse,” said Dono Boestami, the fund’s director. Of course, not only U.S. and EU biofuel policies have driven the palm oil boom. It’s also the flood of private investment from around the world that followed the initial biofuel policy mandates — investments from Malaysian and Indonesian banks as well as Wall Street firms and even, most likely, your own pension fund. The connection matters because the Salim Group has benefited from more than $1.5 billion in loans and capital from foreign investors, including the American firms BlackRock and Vanguard, and Salim companies have pledged that their palm oil is not a product of recent deforestation or peatland destruction. Satellite images from 2017 confirmed that the forests on the Sintang plantations were now virtually gone. If we’re going to turn around the deforestation crisis and its huge contribution to the climate crisis, we need to fundamentally transform capitalism. One way to attack the problem is to force a shift in the business practices of the largest investment firms — the likes of Vanguard and BlackRock, which manage assets in the trillions and have millions of clients worldwide. Despite increasingly loud lip service to sustainability, BlackRock is the largest U.S. investor in the palm oil sector, and the largest investor in climate destruction on earth. That’s why our new campaign addresses both fossil fuels and deforestation — the twin drivers of the climate disaster — by tackling BlackRock’s Big Problem head-on. 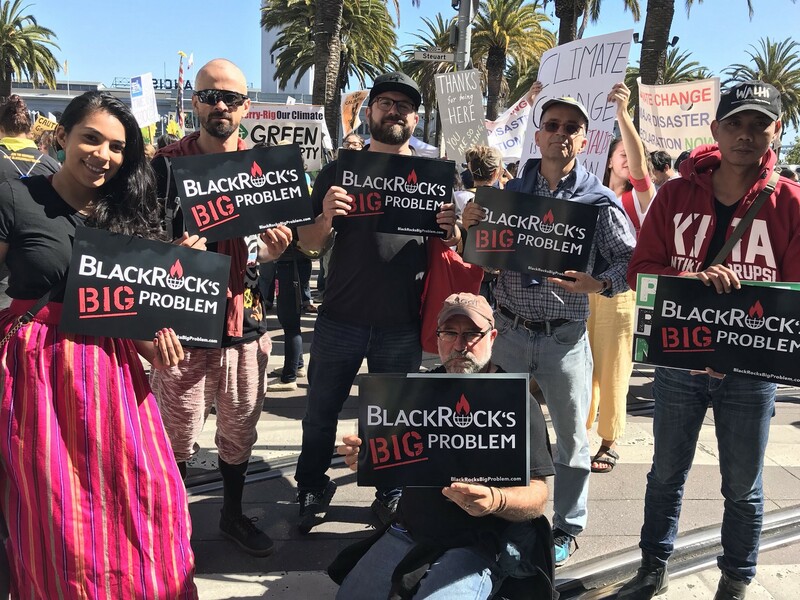 Highlighting BlackRock’s Big Problem at the San Francisco RISE for Climate March, Sept. 2018. In our view, the single best way for us in the U.S. to do our part is to ramp down our energy use, reduce our consumption of luxury goods — including the junk food and cosmetics that use the bulk of palm oil in the U.S. market — and to take every step we can to defund deforestation. And all of this, of course, begins with taking an eyes-wide-open view of the problems fueling the climate crisis — which is why we’re so pleased to see the issue covered in such depth by this past Sunday’s New York Times.